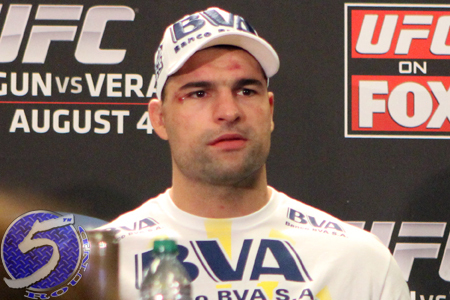 UFC president Dana White said he might have to sit former UFC light heavyweight champion Mauricio “Shogun” Rua (pictured) down to talk about retirement if he lost to James Te Huna on Saturday. No need for that uncomfortable chat, Dana. With his back against the wall having dropped his last two scraps, Shogun responded in violent fashion by putting Te Huna to sleep with a counter left in the first round of their tango. The official stoppage came at the 1:03 mark in the opening frame. The only thing about Shogun’s victory that is rubbing some the wrong way is he unleashed an unnecessarily right bomb when Te Huna was already unconscious on the canvas. Thankfully for Te Huna, Shogun missed and the referee pulled him off before any other strikes were unloaded.